It's been a while, but my last few posts have been on password spraying, which is great approach if your customer has an userid / password interface that faces the internet. I also ran a walk-through on using responder and LLMNR. But what if you are on the outside, and your customer is wise enough to front all of those interfaces with two-factor authentication, or mutual certificate authentication? A common approach is to use a "callback" in an office document (or similar). Place a link in a document, something like a tiny image (even 1x1 pixel) image that points to a UNC path, to a share and file on your (evil) server. 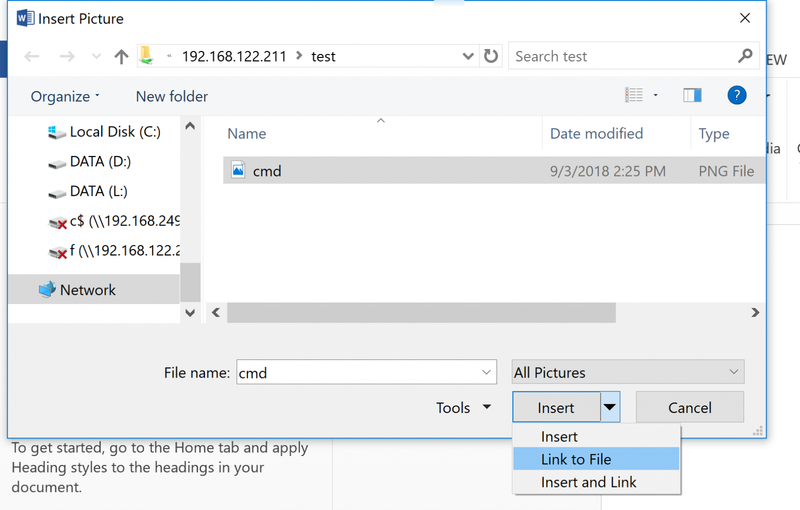 When a victim running Windows opens the file, the credentials and file hash are sent to your link. If you can capture that, say for instance if you are running Responder, you now have their userid and password hash. The password hash is normally quickly cracked using tools like hashcat or john the ripper. Resize this file so that it's small enough to be missed as the client looks at the document. Be sure to choose "insert and link" - this will force the graphic to update when you open the file. Yup, it's that easy! Does it work in Word? Excel, Powerpoint, Publisher? Yup, Yup, Yup! (yup yup)! And not only should they be doing egress filtering, they should be logging hits on those egress filters and even more importantly, hits on those egress filter should be landing on someone's security dashboard. 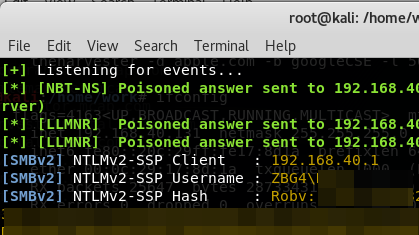 For instance, if I see an inside IP trying to do SMB/CIFS to the outside world, I'll try to obtain both the IP/hostname and if possible the full URI (I think snort will yield the full URI) and then search through recent email logs for that user looking for phishy looking emails containing attachments. That then leads to searching for other similar phish (source IP, source Host, subject line permutations, stuff in the message bodies, etc), which might yield different attachments, different URIs/IPs, which then sends me back to firewall logs (anyone else fall for similar phish using different URIs, etc). Is there a similar way with NTLM authenticated web sites or am I remembering incorrectly to at least gather username/local domain name? acbeko - yes, all great points. I have a story coming up on using GPO to help mitigate this on the victim's host. Mostly I want to make sure that I have a complete list of settings before I post it. Forcing SMB signing helps on this front as well. W60: Yes, you can also do this via web protocols. UNCs are such a "gimmme" though that I thought they deserved a story all on their own. Using UNC links in documents (either office docs, PDFs, or whatever format supports it) is pentest-101, but it's pt101 because it works so well and so often! Brent - yes, anything that hits your egress filter should indicate a compromised host, an attack in progress or at least something you are trying to prevent. Quoting Rob VandenBrink: Brent - yes, anything that hits your egress filter should indicate a compromised host, an attack in progress or at least something you are trying to prevent.